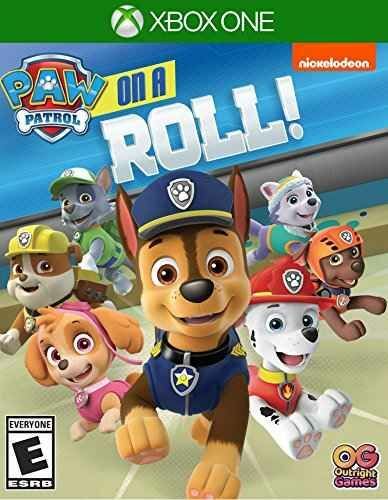 Collectorz.com Core Game Database Xbox One Paw Patrol: On A Roll! Paw Patrol: On A Roll! PAW Patrol is on a roll! No job is too big, no pup is too small! The PAW Patrol is ready to save the day in Adventure Bay on 16 exciting rescue missions, but they can only do it with your help! Help Marshall, Chase, Skye, Rubble Everest, Tracker and the whole team use their unique skills to rescue friends and keep their community safe. Jump into eight awesome Adventure Bay locations, including Farmer Yumi's Farm, Jake's Mountain, a desert canyon, under the waves, and more! Get ready for fun puzzle-platforming action that is PAWfect for kids of all ages with all the pups of the PAW Patrol! With the Lookout as your base, you'll have the whole PAW Patrol team—including Everest and Tracker—on your side. Play as two different pups on each mission and as you help your friends, such as Ryder, Jake, Farmer Yumi and more. Explore the beautifully recreated world of Adventure Bay as you help the PAW Patrol on daring rescues, collect hidden Pup Treats, and play micro-games that make the most of each pup's unique skills —all while learning about teamwork and helping the community. Ryder and all eight PAW Patrol pups, including Everest & Tracker! 16 daring adventures set in 8 Adventure Bay locations! Special pup abilities that need to be used for each rescue! Playing as two different pups per mission!